This bourbon pecan pie includes a small amount of Kentucky bourbon. The bourbon jazzes up this pecan pie with flavor and spirit. The pie includes dark brown sugar, eggs, and butter. The pie may be baked in an unbaked pastry crust, but a partially baked crust will ensure a firm, well-baked bottom. If you like the flavor of toasted pecans, see the tips for how to toast them in advance. There are a variety of alternate versions of this recipe, including maple and brown sugar, and sweet potato. In a food processor, combine flours, powdered sugar, and salt. Pulse a few times to combine. Sprinkle pieces of butter over the flour mixture, stir in lightly, then pulse about 6 times. Sprinkle shortening pieces over the mixture, stir in lightly, then pulse about 6 to 7 more times. Sprinkle with half of the water. Pulse 5 times. Sprinkle with remaining water; pulse about 6 times, until dough begins to clump. Empty the large crumbs into a bowl. Pack and knead just 2 or 3 times. Shape into a disk, wrap in plastic, and chill for about 30 minutes to 1 hour. Roll out on a floured surface to fit the pie pan. Fold over and fit into the pan, cutting off excess. Form a decorative edge around the plate. Before adding the filling, brush with a little of the beaten egg white, if desired. Prepare homemade pastry (see the easy food processor pastry) or use refrigerated dough. Shape into a flattened disk, wrap in plastic wrap, and refrigerate to chill thoroughly. You may use a frozen crust as well. Roll the chilled dough out into a 12-inch circle. Fit the dough into the pie plate and lightly prick all over the bottom with a fork. Refrigerate until you are ready to fill the pie shell. Alternatively, use a frozen deep-dish unbaked crust. In a mixing bowl with an electric mixer, beat the butter with the brown sugar until creamy and light. Add the eggs, one at a time, beating after each addition. Beat in vanilla, salt, corn syrup, and bourbon. Place the pie shell on a baking sheet—this will make it easier to move and will catch any spills. 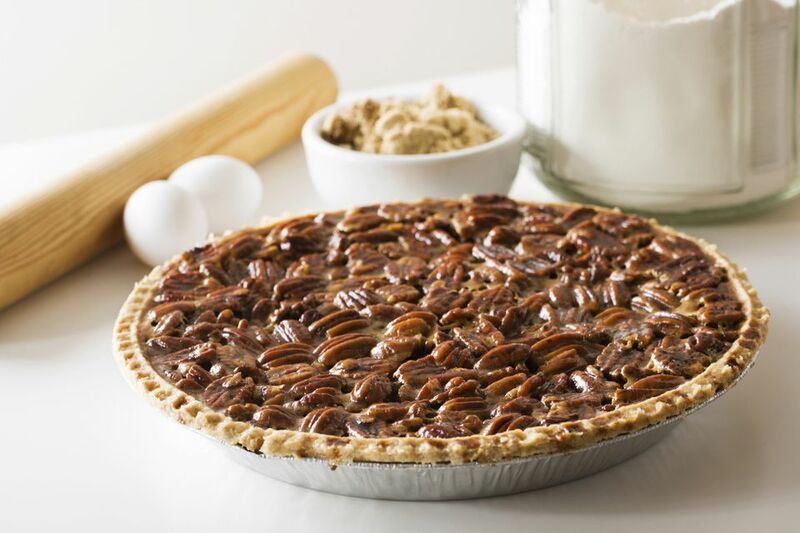 Spread 1 cup of the pecans evenly over the bottom of the pie shell. Pour the filling over the pecans. Sprinkle the remaining pecans over the filling. Bake the pie for 45 to 55 minutes in the preheated oven. Watch the crust edge after 30 to 40 minutes or so. Place a pie shield or a homemade foil ring over the crust edge if it appears to be browning too much. *To partially bake the crust, line the pie plate with pastry. Line the pastry with a sheet of foil or parchment paper. Fill with pie weights or dried beans and bake at 400 F for 10 minutes. Remove the crust from the oven and remove the pie weights and foil. Reduce the oven temperature to 350 F. Fill the pie and bake as directed. Toasted Pecans: If you prefer the flavor of toasted pecans, toast them ahead of time in a 325 F oven. Spread them out on a baking sheet. Toast for 10 to 15 minutes, turning once or twice, or until they are aromatic. Remove them from the oven and transfer them to a plate to cool before using.